At least one doctor still makes house calls, thanks to Amazon. Watch a preview of the Julian Fellowes Presents Doctor Thorne TV show, coming to Amazon, Friday, May 20, 2016. 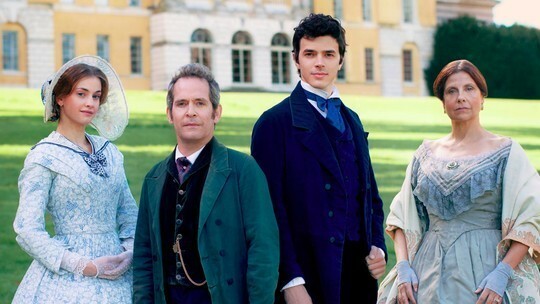 The series, inspired by Anthony Trollope’s book series aired as Doctor Thorne in UK on ITV, in March. Tom Hollander, Rebecca Front, Ian McShane star, and Alison Brie star in the new three-part drama, Julian Fellowes Presents Doctor Thorne, adapted for television by Downton Abbey creator, Julian Fellowes. Watch a preview, below. Get more information from this Amazon press release. SEATTLE – May 3, 2016 – (NASDAQ: AMZN) – Amazon today announced it has added the period drama series Julian Fellowes Presents Doctor Thorne to its lineup of Amazon Original Series, and is scheduled to premiere the series on Prime Video in the U.S. on May 20. A production from The Weinstein Company, Julian Fellowes Presents Doctor Thorne is the latest series from Oscar and Emmy-winning writer Julian Fellowes; and is directed by Niall MacCormick and stars Tom Hollander (Mission: Impossible – Rogue Nation) as Doctor Thorne, Ian McShane (Ray Donovan) as Sir Roger Scatcherd, and Alison Brie (Mad Men) as Miss Martha Dunstable. The series – a story of love, vanity, arrogance and illegitimacy – will debut on Prime Video in the U.S. for Prime members to stream and download at no additional cost to their membership. The Weinstein Company had previously picked up the North American rights to series from Hat Trick International earlier last year. Amazon Prime members can watch the entire first season of Julian Fellowes Presents Doctor Thorne using the Amazon Video app for TVs, connected devices including Amazon Fire TV, and mobile devices, or online at Amazon.com/originals. Customers who are not already Prime members can sign up for a free trial at Amazon.com/prime. Doctor Thorne is a beautiful book written by Anthony Trollope and considered a classic in many countries. Trollope may not be a household name like Jane Austen or Charles Dickens, but there are many people who believe he belongs alongside them in the literary pantheon. Julian Fellowes has adapted this story with the same love and care he gave to Downton Abbey and Gosford Park – for which he won the Oscar for Best Original Screenplay. What do you think? Did you enjoy the Julian Fellowes Presents Doctor Thorne TV series trailer? Do you plan to stream the series on Amazon? More about: Amazon TV shows: canceled or renewed?, ITV TV shows: canceled or renewed?, Julian Fellowes Presents Doctor Thorne, Julian Fellowes Presents Doctor Thorne: canceled or renewed?